JACKSON, Tenn. — The fate of health care in rural communities has many people talking about what needs to happen to provide better services. 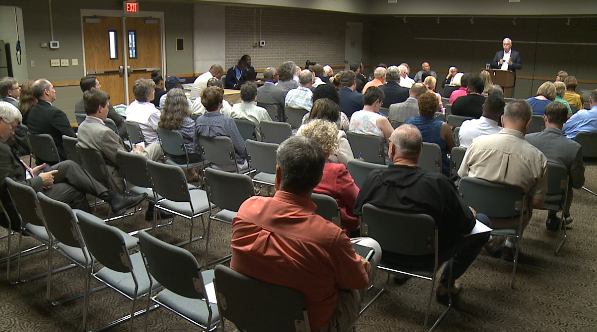 Researchers, state leaders and community members gathered Wednesday to discuss the issue in depth. The state of the nation’s rural health care is a concern for many. “In rural communities where the actual care is disappearing, the hospitals are closing, the physicians are leaving, you need something that’s going to prop up the infrastructure to ensure the viability of healthcare,” panelist Scott Phillips said. Health experts led the forum discussing problems facing rural America. Phillips is the appointed Chief Restructuring Officer of a health system with eight rural hospitals. Phillips said he sees firsthand what’s happening in those communities. “It’s not just spend more money for the existing infrastructure, it’s spend the money appropriately to ensure the next generation in health services are available,” he said. Phillips said you have to look at each rural community differently, but based on need there are some issues that are the same. “Demand for in-patient hospital services is declining, and I don’t see that demand ever returning,” Phillips said. According to the National Rural Health Association, rural populations as a whole are more likely to be under insured or uninsured. Community leaders said it’s time to take action against that issue. Health officials say 95 percent of rural hospitals nationwide are in Republican congressional districts. They say it’s an issue lawmakers need to address. “I think these congressmen really need to sit down with their community leaders and understand the heath care delivery in the rural communities in their districts,” Phillips said. The National Rural Health Association reported 80 rural hospitals have closed nationwide since 2010 with the possibility of 673 additional facilities that could close.